Moreira, M., Rouchon, V., Muller, E., Noirez, S. (2018) The xenon isotopic signature of the mantle beneath Massif Central. Geochem. Persp. Let. 6, 28–32. The origin of the Central European Volcanic Province, which includes the Massif Central and the Eifel regions, is currently debated. Several different causes have been proposed to account for the volcanism observed in the area. Namely, both the presence of one or more mantle plumes under Europe, and the upwelling and melting of upper mantle related to the formation of the Alps, have been suggested as possible drivers of volcanism. In order to distinguish between these possibilities, we have analysed noble gases in the Lignat Spring to constrain the nature of the mantle source below the Massif Central. The gas has a 3He/4He ratio of 5.51 Ra, whereas its neon isotopic signature is identical to that of MORB source. The gas has an 40Ar/36Ar ratio of 1113 ± 3, far in excess of the atmospheric ratio. The xenon isotopic pattern is explained by 95 % atmospheric contamination of a MORB-like gas. The noble gases clearly show that the mantle beneath Massif Central has a geochemical signature similar to MORB source mantle, with the exception of helium, which more closely corresponds to SCLM signatures, and thus removes the need for the presence of a mantle plume in the region. Figure 1 Three-neon isotope diagram. MORB data are from Moreira et al. (1998) and define the MORB-AIR mixing line (Sarda et al., 1988), which has a different slope than the OIB mixing lines (Honda et al., 1991; Moreira et al., 2001). The OIB mixing lines are from Mukhopadhyay (2012) and Peron et al. (2016). The MORB source has a 20Ne/22Ne ~12.5. The neon in Lignat spring comes from the mixture of mantle-derived (~12 %) and atmospheric neon (~88 %). Data from the Eifel area are also reported (Brauer et al., 2013). 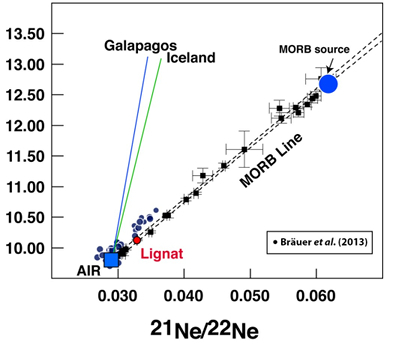 Figure 2 Xenon isotopes in the Lignat gas (aliquots: small red dots; mean: large red dot), compared to MORB (Kunz et al., 1998; Parai et al., 2012; Tucker et al., 2012) and Iceland basalts (Mukhopadhyay, 2012). The Eifel gas is shown for comparison (small blue squares: aliquots, large blue square: mean) (Caracausi et al., 2016). The inserts represent the global scale of variation in mantle-derived samples. Figure 3 Xenon isotopic ratios in the Lignat gas expressed in ‰ deviation relative to the atmospheric composition. Assuming the xenon composition reflects mixing between air and MORB (or CO2-well gas; Holland and Ballentine, 2006), one can estimate the proportion of atmospheric xenon. Using the 136Xe/130Xe ratio, 95 % of the 130Xe in the Lignat source is sourced from the air. The other isotopic ratios can be estimated using this mixing proportion. Two patterns are given for the result of this mixing: violet using CO2-well gas and green using the mean MORB-source ratios (Table S-2). The Lignat gas satisfies a simple binary mixture between air and MORB. Although the Eifel gas (blue circles) shows the same pattern for fissiogenic isotopes, it exhibits notable excesses in light Xe isotopes that are unaccounted for by the MORB-AIR mixing model. Kurz, M.D., Jenkins, W.J., Hart, S.R. (1982) Helium isotopic systematics of oceanic islands and mantle heterogeneity. Nature 297, 43-47. Honda, M., McDougall, I., Patterson, D.B., Doulgeris, A., Clague, D. (1991) Possible solar noble-gas component in Hawaiian basalts. Nature 349, 149-151. Moreira, M., Allègre, C.J. (1998) Helium - Neon systematics and the structure of the mantle. Chemical Geology 147, 53-59. Ozima, M., Podozek, F.A., Igarashi, G. (1985) Terrestrial xenon isotope constraints on the early history of the Earth. Nature 315, 471-474. Kunz, J., Staudacher, T., Allègre, C.J. (1998) Plutonium-Fission Xenon Found in Earth's Mantle. Science 280, 877-880. Mukhopadhyay, S. (2012) Early differentiation and volatile accretion recorded in deep mantle Neon and Xenon. Nature 486, 101-104. Moreira, M., Kunz, J., Allègre, C.J. (1998) Rare gas systematics on popping rock : estimates of isotopic and elemental compositions in the upper mantle. Science 279, 1178-1181. Caffee, M.W., Hudson, G.P., Velsko, C., Huss, G.R., Alexander, E.C., Chivas, R. (1999) Primordial noble gases from earth's mantle: identification of primitive volatile component. Science 285, 2115-2118. Holland, G., Ballentine, C.J. (2006) Seawater subduction controls the heavy noble gas composition of the mantle. Nature 441, 186-191. Holland, G., Cassidy, M., Ballentine, C.J. (2009) Meteorite Kr in Earth’s Mantle Suggests a Late Accretionary Source for the Atmosphere. Science 326, 1522-1525. Marty, B., Altwegg, K., Balsiger, H., Bar-Nun, A., Bekaert, D.V., Berthelier, J.J., Bieler, A., Briois, C., Calmonte, U., Combi, M., et al. (2017) Xenon isotopes in 67P/Churyumov-Gerasimenko show that comets contributed to Earth's atmosphere. Science 356, 1069-1072. Pujol, M., Marty, B., Burgess, R. (2011) Chondritic-like xenon trapped in Archean rocks: A possible signature of the ancient atmosphere. Earth and Planetary Science Letters 308, 298-306. Ballentine, C., Barfod, D. (2000) The origin of air-like noble gases in MORB and OIB. Earth and Planetary Science Letters 180, 39-48. Brauer, K., Kampf, H., Niedermann, S., Strauch, G. (2013) Indications for the existence of different magmatic reservoirs beneath the Eifel area (Germany): A multi-isotope (C, N, He, Ne, Ar) approach. Chemical Geology 356, 193-208. Caracausi, A., Avice, G., Burnard, P., Furi, E., Marty, B. (2016) Chondritic xenon in the Earth’s mantle. Nature 533, 82-85. Merle, O., Michon, L. (2001) The formation of the west European rift: A new model as exemplified by the Massif Central aera. Bulletin de la Societé Géologique de France 72, 213-221. Gautheron, C., Moreira, M., Allegre, C.J. (2005) He, Ne and Ar composition of the European lithospheric mantle. Chemical Geology 217, 97-112. Buikin, A.I., Trieloff, M., Hopp, J., Althaus, T., Korochantseva, E.V., Schwarz, J.P., Altherr, R. (2005) Noble gas isotopes suggest deep mantle plume source of late Cenozoic mafic alkaline volcanism in Europe. Earth and Planetary Science Letters 230, 143-162. ). Our results show that noble gases have signatures consistent with those expected from a mantle source similar to that of MORB, obviating the need for a deep mantle plume. The Lignat spring (“La Gargouillère”) is located in the Massif Central, ~15 km from Clermont Ferrand, France (45°42'23" N, 3°15'42" E). This source was selected because of its vigorous eruptive activity that liberates pure CO2. The gas was collected in January 2017 in a 5 litre stainless-steel reservoir. The gas was analysed at IFPEN for abundances of major gases and noble gases. It contains 100 % CO2, 38 ppm helium, 6 ppb neon, 53 ppm argon and 0.8 ppb xenon. The CO2 δ13C is -3.6 ‰ and the CO2/3He is 3.7 x 109. Noble gas isotopic compositions were analysed at IPGP following the analytical procedure described in the Supplementary Information. Parai, R., Mukhopadhyay, S., Standish, J.J. (2012) Heterogeneous upper mantle Ne,Ar and Xe isotopic compositions and a possible Dupal noble gas signature recorded in basalts from the Southwest Indian Ridge. Earth and Planetary Science Letters 359-360, 227-239. Tucker, J.M., Mukhopadhyay, S., Schilling, J.-G. (2012) The heavy noble gas composition of the depleted MORB mantle (DMM) and its implications for the preservation of heterogeneities in the mantle. Earth and Planetary Science Letters 355-356, 244-254. ). Although the excesses are small, the gas contains a detectable contribution of mantle-derived xenon. The Lignat gas falls on the MORB/Iceland line and is clearly different from the Eifel gas value in a 129Xe/130Xe - 136Xe/130Xe diagram. The non-radiogenic isotopic ratios 124Xe/130Xe, 126Xe/130Xe and 128Xe/130Xe are atmospheric within uncertainty. Sarda, P., Staudacher, T., Allègre, C.J. (1988) Neon isotopes in submarine basalts. Earth and Planetary Science Letters 91, 73-88. Moreira, M., Breddam, K., Curtice, J., Kurz, M. (2001) Solar neon in the Icelandic mantle: evidence for an undegassed lower mantle. Earth and Planetary Science Letters 185. Peron, S., Moreira, M., Colin, A., Arbaret, L., Putlitz, B., Kurz, M.D. (2016) Neon isotopic composition of the mantle constrained by single vesicles analyses. 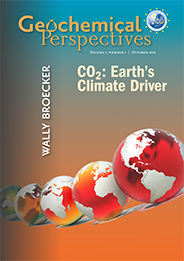 Earth and Planetary Science Letters 449, 145–154. ). The inserts represent the global scale of variation in mantle-derived samples. Allègre, C.J., Moreira, M., Staudacher, T. (1995) 4He/3He dispersion and mantle convection. Geophysical Research Letters 22, 2325-2328. Gautheron, C., Moreira, M. (2002) Helium signature of the subcontinental lithospheric mantle. Earth and Planetary Science Letters 199, 39-47. Ballentine, C.J. (1997) Resolving the mantle He/Ne and crustal 21Ne/ 22Ne in well gases. Earth and Planetary Science Letters 152, 233-250. Hopp, J., Trieloff, M., Altherr, R. (2004) Neon isotopes in mantle rocks from the Red Sea region reveal large-scale plume-lithosphere interaction. Earth and Planetary Science Letters 219, 61-76. ), one can estimate the proportion of atmospheric xenon. Using the 136Xe/130Xe ratio, 95 % of the 130Xe in the Lignat source is sourced from the air. The other isotopic ratios can be estimated using this mixing proportion. Two patterns are given for the result of this mixing: violet using CO2-well gas and green using the mean MORB-source ratios (Table S-2). The Lignat gas satisfies a simple binary mixture between air and MORB. Although the Eifel gas (blue circles) shows the same pattern for fissiogenic isotopes, it exhibits notable excesses in light Xe isotopes that are unaccounted for by the MORB-AIR mixing model. ). However, for the aforementioned reasons, other explanations are required to account for the high 124-129Xe/130Xe ratios in these air-contaminated gases (Fig. 3). 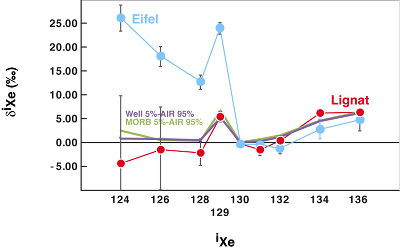 For the Eifel, a simple MORB-AIR mixing scenario would not be able to satisfy both the 131-136Xe/130Xe, He, Ne isotopic ratios and the 124-129Xe/130Xe ratios. A deep mantle plume origin for the volcanism in Eifel therefore remains questionable and further work is clearly required to understand the signatures observed in springs in both the Massif Central and the Eifel. We have analysed noble gases in the Lignat thermal spring (Massif Central) in order to characterise the noble gas isotopic composition of the mantle under the CEVP. The sample shows extensive atmospheric contamination, but measurable mantle-derived noble gases. The 3He/4He ratio is 5.51 ± 0.03 Ra. The neon isotopic composition falls exactly on the MORB line in the three-neon isotope diagram. 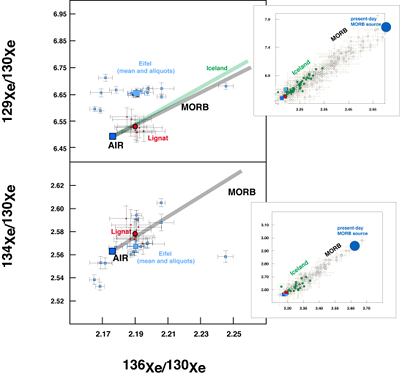 The 124-128Xe/130Xe ratios are atmospheric within uncertainties whereas 129-136Xe/130Xe ratios show evidence for the contribution of a typical MORB signature, in agreement with the neon isotope systematics. The isotopic spectrum of xenon is well explained by a mixture between atmospheric and present-day MORB-source xenon. The mantle under Massif Central thus appears distinct from the mantle beneath Eifel. We thank the three reviewers for their constructive comments on the manuscript. M.M. acknowledges the Labex UnivEarthS for its financial support (IPGP # 3914). Helium is more radiogenic than the mean MORB ratio of 8 ± 1 Ra (Allègre et al., 1995), and within uncertainty of the mean SCLM ratio of 6.1 ± 0.9 Ra (Gautheron and Moreira, 2002). A simple calculation indicates that ~12 % of the neon is derived from the mantle, assuming a 20Ne/22Ne for the MORB source of 12.5 (Ballentine, 1997; Moreira et al., 1998). However, xenon analysis in oceanic basalts remains difficult because of its low abundance, in addition to the presence of a ubiquitous atmospheric contaminant that masks the mantle signature (Ballentine and Barfod, 2000). Indeed, mantle-derived noble gas signatures are observed at Victoriaquelle in the Eifel volcanic region, Germany (Brauer et al., 2013). Interestingly, the authors observed a xenon signature that does not fall on the MORB-OIB line in the 129Xe/130Xe-136Xe/130Xe diagram, although the He and Ne clearly have signatures consistent with their derivation from MORB- or Sub Continental Lithospheric Mantle (SCLM)-sources (Brauer et al., 2013). Figure 1 [...] Data from the Eifel area are also reported (Brauer et al., 2013). Based on neon isotopes measured on xenoliths, Buikin et al. 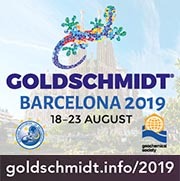 (2005) suggest that there is a mantle plume contributing to the European intraplate magmatism, an interpretation challenged by other authors who argue that the source was restricted to the upper mantle (Gautheron et al., 2005; Brauer et al., 2013). Several scenarios have been proposed to account for the widespread volcanism in the region: an asthenospheric upwelling resulting from the formation of a deep lithospheric root under the Alps (Merle and Michon, 2001), the melting of the Sub-Continental Lithospheric Mantle (SCLM) (Gautheron et al., 2005) or a deep-seated mantle plume (e.g., Buikin et al., 2005). These samples therefore provide fundamental constraints on the origin and evolution of terrestrial noble gases (Caffee et al., 1999; Holland and Ballentine, 2006). Recently, this spring has been studied for xenon, providing constraints on the xenon composition of the mantle and on the nature of volcanism in the Eifel region (Caracausi et al., 2016). The 129Xe/130Xe, 134Xe/130Xe and 136Xe/130Xe isotopic ratios of the Lignat gas are reported in Figure 2 and compared with those of MORB (Kunz et al., 1998; Parai et al., 2012; Tucker et al., 2012), Iceland (Mukhopadhyay, 2012) and Eifel (Caracausi et al., 2016). Figure 2 [...] The Eifel gas is shown for comparison (small blue squares: aliquots, large blue square: mean) (Caracausi et al., 2016). The 131-136Xe/130Xe isotopic signature of gases from the Eifel region determined by Caracausi et al. (2016) is identical to that of the Lignat gas (Fig. 3). Even if the present-day mantle had a chondritic composition in these isotopes, given 95 % contamination by air, then an excess of only 3 ‰ should be observed for the 128Xe/130Xe ratio, rather than the 15–25 ‰ reported by Caracausi et al. (2016). A deep mantle plume origin was also suggested based on xenon isotopes by Caracausi et al. (2016) on the basis of the 129Xe/136Xe ratio, which appears to be close to that of Icelandic basalts (Mukhopadhyay, 2012). Existing evidence shows that the primitive mantle had a chondritic xenon isotope composition (Holland and Ballentine, 2006; Holland et al., 2009), and that the xenon of the Hadean atmosphere was a mixture of chondritic and cometary xenon (Marty et al., 2017). Furthermore, subduction of atmospheric xenon has modified the non-radiogenic xenon isotopic ratios of the mantle from a chondritic ratio down to the present-day mantle composition (Holland and Ballentine, 2006). The MORB signature is estimated using both MORB data from Kunz et al. (1998) and CO2-well gases by Holland and Ballentine (2006). In detail, because the gas contains ~95 % air-derived xenon, this atmospheric contribution completely masks the present-day mantle composition for these isotopes, which could not be chondritic because the mantle was “contaminated” by subducted atmospheric xenon (Holland and Ballentine, 2006). Figure 3 [...] Assuming the xenon composition reflects mixing between air and MORB (or CO2-well gas; Holland and Ballentine, 2006), one can estimate the proportion of atmospheric xenon. Certainly, in MORB or CO2-well gas sources, there is no hint of such a signature (Kunz et al., 1998; Holland and Ballentine, 2006), and the same is true for OIB. Helium and neon are clear markers of the layered structure of the mantle, because their isotopic ratios are less radiogenic in most Oceanic Island Basalts (OIB) than in Mid Ocean Ridge Basalts (MORB), which is interpreted as reflecting the existence of a deep undegassed mantle, the source of mantle plumes (Kurz et al., 1982; Honda et al., 1991; Moreira and Allègre, 1998). Figure 1 [...] MORB data are from Moreira et al. (1998) and define the MORB-AIR mixing line (Sarda et al., 1988), which has a different slope than the OIB mixing lines (Honda et al., 1991; Moreira et al., 2001). Nevertheless, the neon isotope systematics, which are sensitive to the contribution of primitive mantle (Moreira and Allègre, 1998; Hopp et al., 2004), appear to preclude the contribution of deep mantle material in the source of the Lignat spring. Xenon in oceanic basalts also places strong constraints on the degassing history of the mantle and on the origin and evolution of volatiles (Ozima et al., 1985; Kunz et al., 1998; Mukhopadhyay, 2012). Figure 2 Xenon isotopes in the Lignat gas (aliquots: small red dots; mean large red dot), compared to MORB (Kunz et al., 1998; Parai et al., 2012; Tucker et al., 2012) and Iceland basalts (Mukhopadhyay, 2012). Radiogenic/fissiogenic isotopic ratios (129, 131-136Xe/130Xe) are well constrained in the sources of MORB and OIB using neon as a proxy for the degree of contamination by air (Moreira et al., 1998; Mukhopadhyay, 2012). Figure 1 [...] The OIB mixing lines are from Mukhopadhyay (2012) and Peron et al. (2016). The 128Xe/130Xe ratios measured in Iceland basalts are close to the atmospheric value, and are distinct from chondritic 128Xe/130Xe value in high 20Ne/22Ne and 129Xe/130Xe crushing steps (Mukhopadhyay, 2012). The physical mechanism for such loss is unknown, however it has caused considerable isotopic fractionation and resulted in the present-day atmospheric isotopic composition (Pujol et al., 2011).